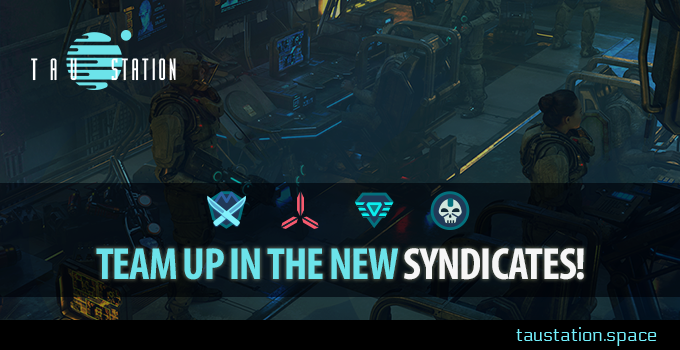 In Syndicates you can team up with others. Every membership is displayed in public and the game supports the organization and communication of every alliance. Syndicates are optional for those who love cooperation and enjoying time with friends, but you can still stay on your own if you want to. A membership is exclusive, you can only be part of one group, and decide to quit and change at any time. This week’s game update implemented the needed basics into Tau Station; future updates will bring you various multiplayer features for Syndicates and improvements. This article also gives you a glimpse on some future extensions. As usual, the entire Community is invited to discuss and suggest additional ideas on the forums! At the current state, you will find important aspects in two different areas in the navigation of Tau Station: the entire licensing and foundation process takes place at the Government Center. The new “Syndicates” option in your CORETECHS holds a list of all existing (founded) syndicates, and -in case of membership- all internal and organizational insights of your group. Foundation – How to become a Leader? If you want to start your own Syndicate, visit a Government Center to apply for a Syndicate license. The founder takes the role of the main leader. Requirements – How to get a License? Level – Minimum level is 16 (for the foundation, not for joining!). Skills – Completed University course of “Introduction to Leadership”. Skills – Completed Syndicate Foundation level 1 = “Syndicate Basics”. Reputation – Respected or higher reputation with intended home station’s faction. Fee – 100,000 Credits for getting a license. If all conditions are met, you get the permission to apply for an official syndicate license. In case you’re not able to become a leader yet, it’s possible to simply join a Syndicate by asking for membership (also explained in this article). You can also set 2 optional membership criteria, a specific genotype and minimum level. This way you can specify a bit more in detail what kind of members you are searching for. By default, all levels and all genotypes are allowed. – No matter what you define, all applications still need to be confirmed before anyone joins your Syndicate! Final Foundation – Supporters wanted! The authorities will give the final permission for the creation of a new syndicate, only if enough citizens support the application by signing. Within 5 days you need to find 3 citizens to sign your application. So, make sure to organize friends or ask for supporters in chat, because the credit fee won’t be refunded in case of failure! 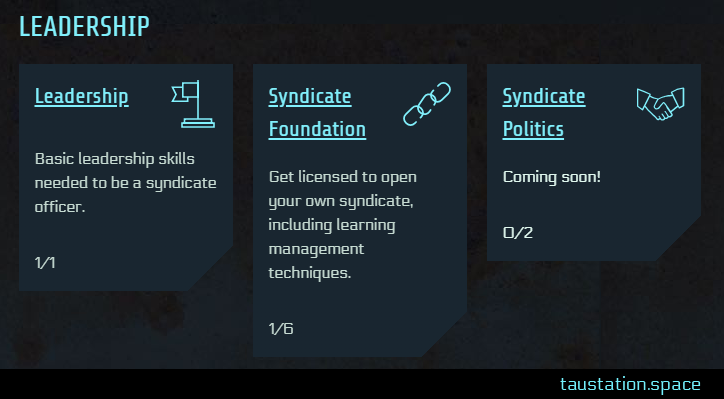 If 3 citizens without a current syndicate membership support you within 5 days, the foundation was successful. You are the leader of a brand new syndicate which can now be found in the CORETECHS list of existing Syndicates. The 3 supporters automatically turn into the first membership applicants to be accepted (or rejected!) by you. 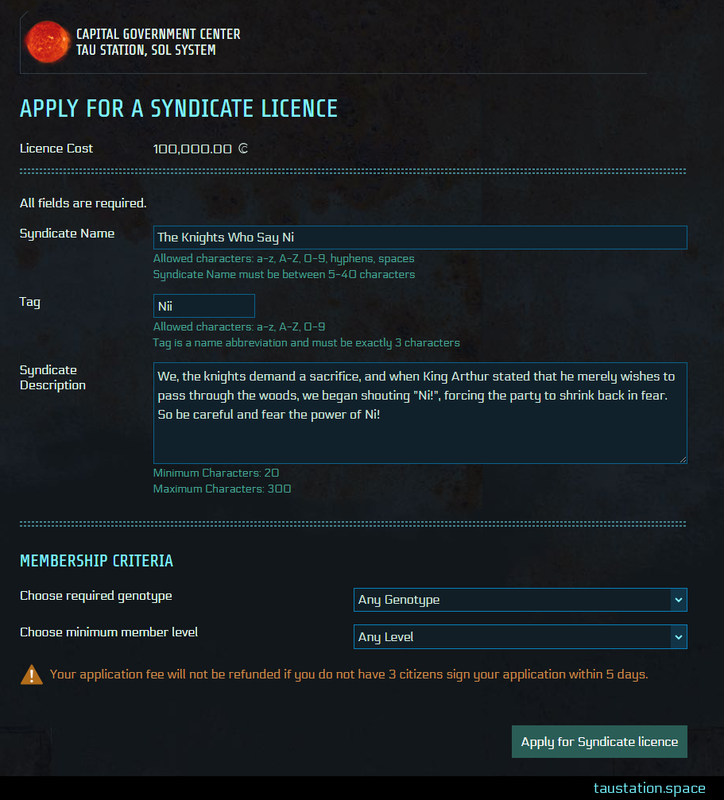 How to join a Syndicate? Not everyone can be a leader; reliable members are as much as important! Talking about reliability, only one active application is possible at a time. Supporting a Syndicate in the foundation process at the Government Center is one way for a membership application. If you want to give your signature for one alliance, check the details of according groups which are listed at the Gov’t Center (if there are any in foundation process). Like the founder, you also need to meet the minimum faction reputation as a signee. The second way is to apply for membership at an existing Syndicate. This is even easier as there are reputation requirements. 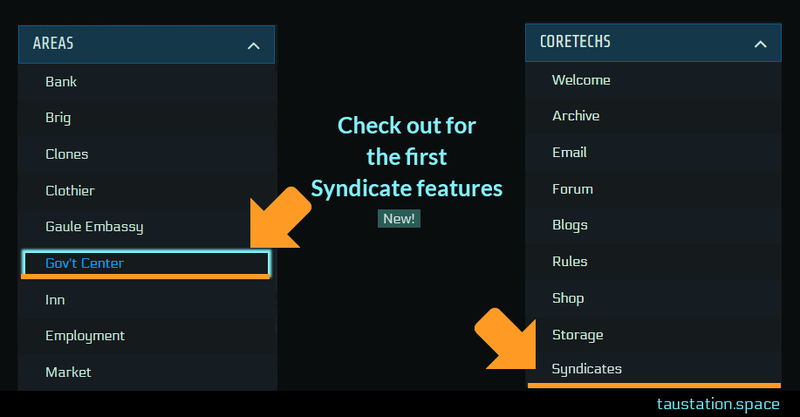 Check the list of all syndicates at CORETECHS – Syndicates. You can even filter for those that are searching for reinforcements right now. 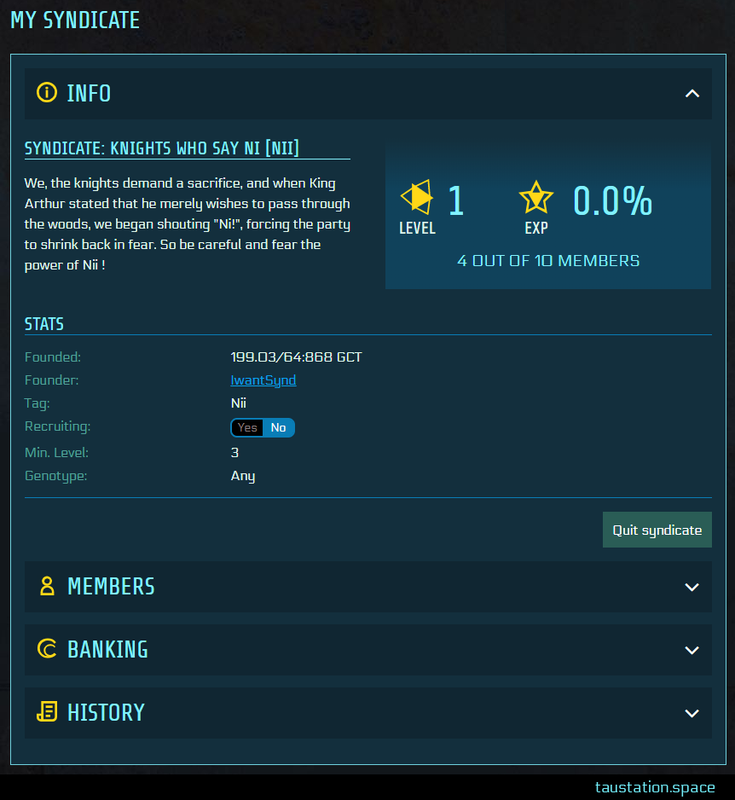 A button to apply for membership is available in the detail view of recruiting Syndicates. Again, only one active request is allowed! If you want to change your decision, you’ll need to withdraw the active application first. The last step of becoming a member is just the decision of the Syndicate to let you in (or not). For all members, the CORETECHS section holds the internal management options and overviews, shown above the general list of all existing syndicates mentioned beforehand. In general you can expect that the following details explained are just a starting point. As syndicates will get a lot of features and options, many updates will extend the current UIs, and on top to that, we keep listening to your ideas and improvement suggestions as usual. 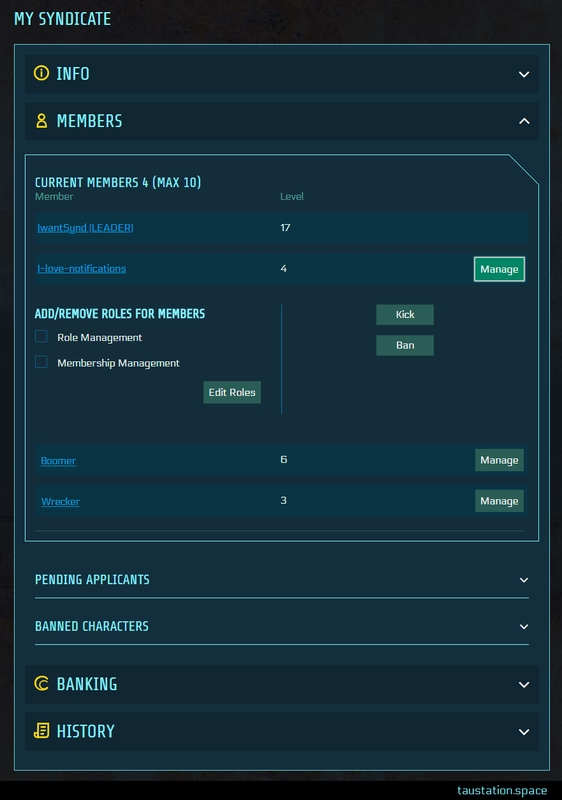 The first part sums up the most important aspects like your Syndicate’s level, experience points, total members, description text, the unique tag which indicates the membership in front of citizen names, foundation details, recruiting status and according requirements. You can also quit membership in this screen. Similar to your character, the level will unlock new opportunities over time. According rights presumed, you can turn on or off the recruiting status. 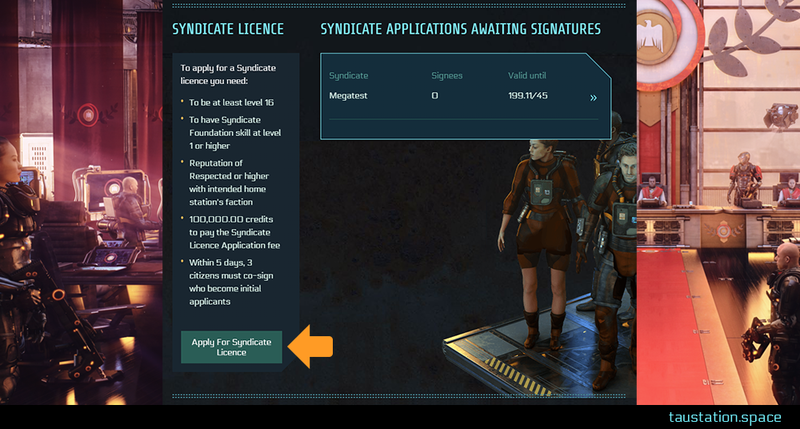 With one of the next updates, it will also be possible to modify several aspects like the description text and requirements for recruits after your Syndicate has been founded. 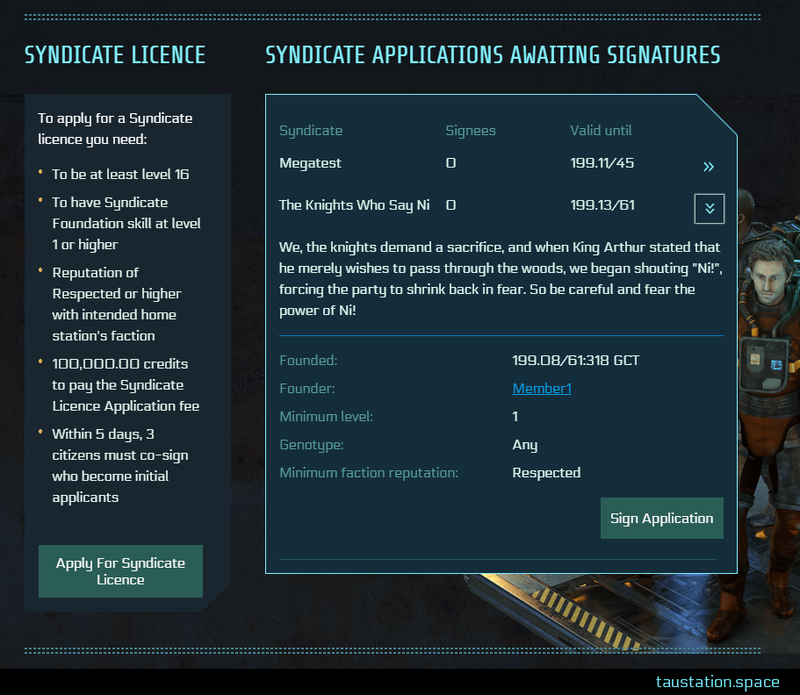 A new syndicate license holds space for 10 members, but together you will be able to extend it in order to invite more people. The members section consists of 3 parts. The first one enlists the current members with management options for the leader or members with according rights granted. So far, a leader can distribute role management and membership management rights; with future complexity there will be even more roles. Besides role management, members can also get dismissed from the syndicate or even kick-banned in case of conflict to avoid that this person can apply for membership again. 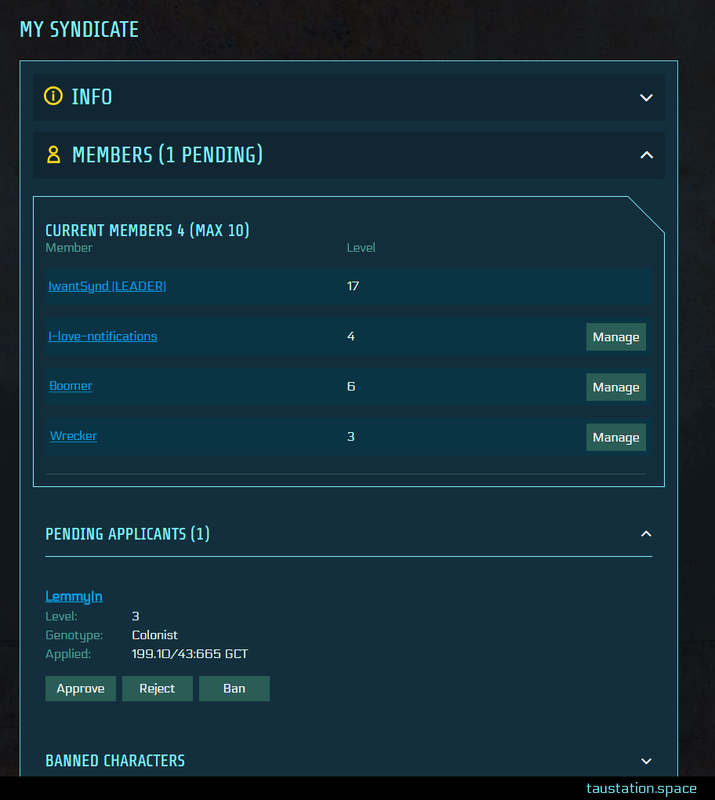 The second part of members section is the list of all pending applicants, showing basic details, also including a link to their profiles. The leader and everyone with membership management rights can either accept, reject or even ban applicants. They can also see the full citizen profile, including stats, education, skills, clones, bank accounts, and so on! The result of a ban is similar to one for a member: this citizen won’t be able to apply for membership anymore (until they get removed from the blacklist). With one of the next updates, an application will get a cool down of 1 day to contain multiple application floods and to help you, using a ban only in worst case. The third part of the member section is about banned characters. Like mentioned before, “blacklisted” citizens cannot apply for membership anymore. But such a decision can be revoked anytime via “unban”. 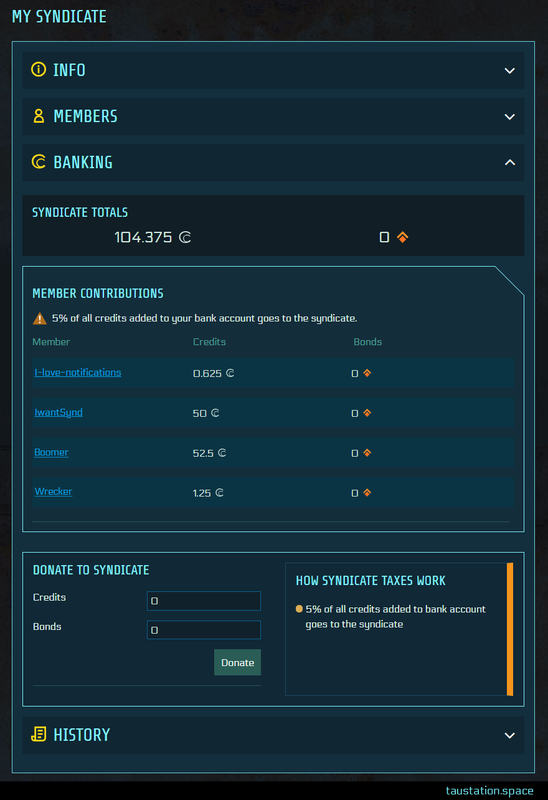 Every Syndicate has an internal bank for credits and bonds. This will be relevant in the future when your alliance can expand their options (spoiler: you might be able to build something, but there will be even more). Besides the total balance, every members contributions are listed in detail. Everyone can donate both currencies on free will, but there is also a tax system for credits. Every time, you put credits to the bank, the Syndicate gets a share. Example of 5%: putting 100 credits to your bank account leads to 95 credits private savings, while 5 credits go automatically to the syndicate’s piggy bank. Right now a tax rate of 5% is set in stone but you will be able to change it with one of the next updates; even 0% will be possible if you prefer to have a donation based system only. The history log will come with one of the next updates. 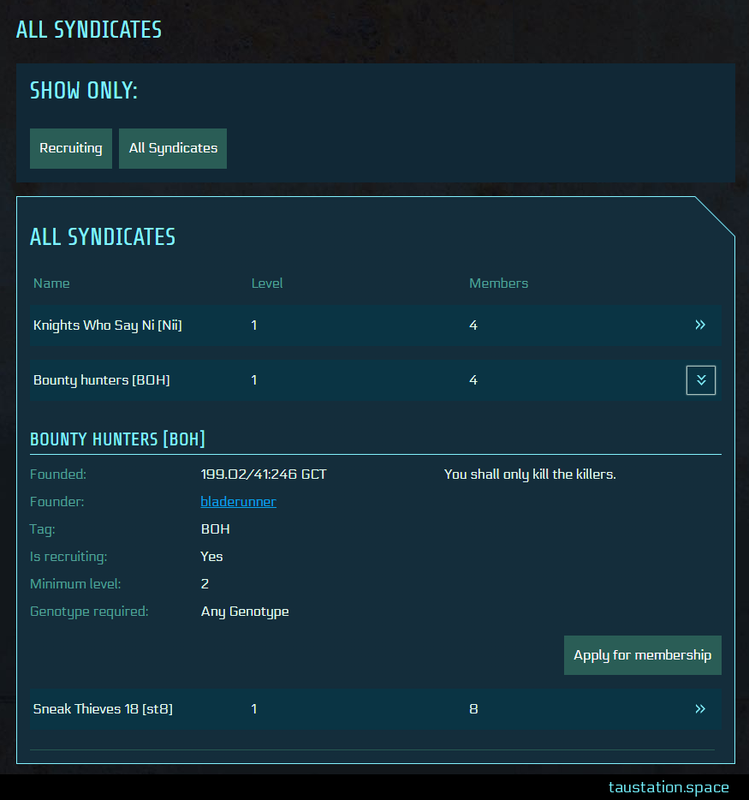 Campaigns: Special campaigns for your syndicate, all members can join.